AnyIndo - In this article we are going to share an article it is Change Qwerty Keyboard To Alphabet Keyboard Mode On Asus Zenfone. Some Zenfone user, or probably android user feeling so complicated when they use qwerty keyboard mode on their device. This happened to me when I used Nokia N9 because it looks like bothers me when I need to type fast but I typed wrong letter. 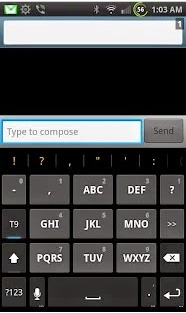 As my experience when using Nokia N9, finally we found best application to make it easier when typing on Asus Zenfone 5. I have Asus Zenfone 5 but don't use this application yet because I think qwerty keyboard is good enough for me nowadays. This application is dedicated to Asus Zenfone user if they think that typing qwerty keyboard mode their Asus zenfone is complicated. Designed and optimized for layout mode. That's all about Change Qwerty Keyboard To Alphabet Keyboard Mode On Asus Zenfone. if you have any question related to this article you can leave comment bellow. if we are not busy we will reply it as soon as possible. Belum ada tanggapan untuk "Change Qwerty Keyboard To Alphabet Keyboard Mode On Asus Zenfone"